Is it just me or does Twin sound like a Megaman X game? Warning! Sigma is Approaching Fast! I loved the Twin G.T. fight too, was pretty hype when I heard the music. Its a lot more exciting than the actual final boss of Twin, they should have used it there instead imo. However, with the Wave, I picked my shots way more often as there is one less available shot. For the most part Darius 1 is designed to be played without autofire using precise tapping. The Autofire is pretty much for point blanking and nothing else. But for me that's really a huge part of the game's personality and feel. ^ Loving it. That Sagaia cab has the best artwork of any cab bar none (IMHO). Got any more pics to drool at? 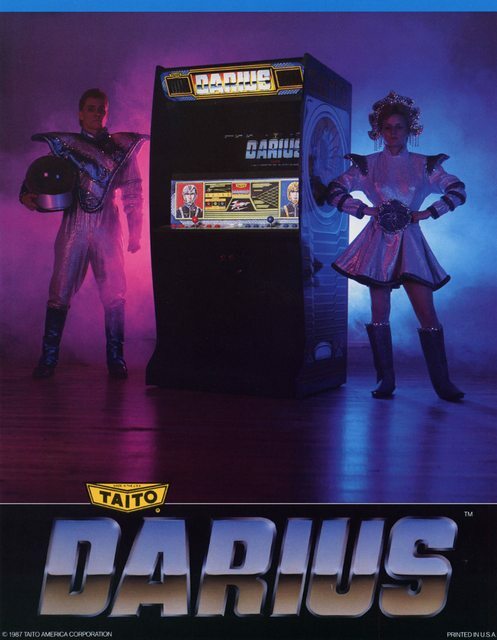 Also, that post about the mini japanese darius cab is Awesome! He made vector art and everything! Incredible attention to detail and quality. This thread has been a totally awesome lately. Just got Darius Gaiden off of craigs list . Haven't really had a chance to really get into it, as I was gone on vacation. From the little I played ,it seems awesome. I think I like the look of this one a little more than G. Darius on PS. Yeah, DBACEX is great for people of all skill ranges I think. So dang good. I cant help but feel grateful for all the Darius knowledge here. I just got Gaiden, and after reading all the comments on autofire, Ive decided not to use it. Even as a Darius newb and really general shmup newb, I Cant wait to get into this gem. G-Darius on Taito Legends 2 is actually 5-15 frames faster believe it or not (though it occasionally has a bit of slowdown). Frames? Per second? I really really doubt that's correct. Hey I just noticed the Darius store was FINALLY updated with something else. A mug and some kind of towel thing. No idea what it says. I'm really into that mug... but not at that price. I'd love to reply more indepth to the discussions for the last few pages; I haven't summoned forth the energy yet. On a technical level, yeah, but I thought the common consensus here was that G-Darius on Taito Legends runs without most of its slowdown that's on the PCB, meaning it is a "faster" game than the arcade board. It doesn't affect anything other than making it harder though. There's quite a difference between being 5-15 frames faster and having no slowdown They're not even remotely close, even. Is there input lag on the PS2 version of Darius Gaiden on Taito Legends 2 (US version)? I haven't tried G-Darius yet, but compared to the arcade cabinet I play on, it seems close to a 1/10th to quarter of a second delay...is that possible? Or are my HDTV setting off? I have a near lagless LCD (Samsung UN32EH4003) that is fine for everything else I play on it. In an attempt to "get" darius, I played a bunch of Darius Burst on ppsspp. After I realized that I could detach the burst cannon, the game made far more sense and became far more satisfying. I will say one thing about the game: it absolutely nailed the atmosphere: the backgrounds and the music combine to create this dreamy, surreal ethereal effect. Great game Darius Burst on PSP! I'm stuck on Mirage Castle in Burst, but I am slowly making progress! I also discovered a hidden 1-up in the stage before it, so that's certainly handy! I also decided to check out Darius Gaiden again, and this time I think I finally "got" it: it suddenly feels really intense and fun, and the atmosphere again is top notch! I think part of why it suddenly feels intense is because Burst is comparatively a bit on the easy side (not to say it's bad, quite the contrary, but not as good as gaiden). I have finally accepted the Darius love into my heart. I just realized that I could plug a HDMI cable into my laptop and connect it to the big widescreen tv in the living room to play Darius 1 and 2 on. Yes, it's awesome, isn't it? I don't know about input lag, but, if I remember correctly, rapid fire doesn't work right in that version. I'm not sure how the issue happened, but I'm guessing it was an attempt by Atomic Planet to remove input lag that caused other problems instead. The frustrating thing is that these issues were a carry over from the EU version and the US version actually breaks a game that worked in the EU version (Puzzle Bobble 2, though this issue is unrelated to input lag and more related to changing to a different version of the game without even testing it to make sure the music works correctly). Darius Gaiden is a bitchin' multiplayer game! I assumed Gaiden might have a bit too much going on and the need to share powerups would make things too hard, but actually with a properly skilled partner and a plan for powerup distribution and gameplay roles, the game is very playable and fun in multi. Recently my wife and I did the 2cc of ACEHLQV. Our rule is that we each get one credit, and if both of us don't clear the 2cc is considered a failure. Only took us a couple days to clear, despite Ashy being new to Gaiden (she is far from inexperienced with shmups though, not sure how well a non-shmup player could perform here). 1. Your bomb resources are doubled, which helps deal with some of the occasionally chaotic situations created by erratic stray bullets. THere are points in multiplay that will force your hand that you probably would have under control in single play. 2. Boss HP is the same as single player mode, making speed kills occasionally viable. This results in the 2cc actually being easier than the 1cc if both players have a bit of coordination. 3. Normally enemies that spawn from behind in Gaiden change whether they spawn on the top or bottom of the screen based on your positioning in order to avoid cheaply killing you. In multi if one player is at the top and one is at the bottom, there's a good chance one of you will be killed in these spots. 4. To avoid being killed by spawning enemies and creating overly chaotic bullet patterns, both players should attempt to defend and stay in or near a neutral "sweet spot" for the majority of the game. In Gaiden this spot is vertically in the center of the screen, and about 1/3rd of the total screen length away from the left edge. This is helpful in Gaiden even in single play, but especially important in multi. 5. For weapon powerups, one player should take 2 red orbs (3 white bullets) and all of the missile powerups. This players primary role is damage output and point blanking. As a result this player is the most likely to be killed. The missiles will protect this player from zako as they point blank, and missiles are not lost upon death. In the event of a death this player will be able to easily recover. 6. The other player should take every red powerup after the point blanker powers up and none of the missiles. This player's primary role is using the wave to kill tricky and protected enemies in order to defend the point blanker. As a rule the wave user should avoid dangerous situations as losing the wave could ruin your entire run. 7. The point blanker should take extends, because the wave user can't afford to die in the first place. 8. Shield distribution can be handled in a few ways, depending on player ability. At a minimum, each player should try to maintain a fully powered shield at all times, so whoever has the least 'health' at any given time should take the next shield. Your strategy for extra shield distribution depends on player need. In general the less experienced player should take the extras, but if both players are of a similar level another strategy would be one player taking extras until they upgrade to silver, and then the other player taking them to do the same. Anyhow I hope some of you Gaiden fans give this a shot and spread the Darius Love. Gaiden multiplay is an incredibly fun and overlooked aspect of the game that can be played in a serious manner befitting shmups forum. Heh, I think you actually highlighted a lot of the reasons why Gaiden actually isn't a very well-designed co-op experience. There are far from enough power-up items to service both players, and a lot of enemy attack patterns are clearly designed to be dodged by one player only. With more hectic attacks it can be quite difficult to tell what's going on, and they can require very synchronized dodging for both players to avoid. You definitely need some planning and strategy as you've outlined to beat it without continuing. What I've done in the past is give the shot power-ups to the more skilled player and all the rocket power-ups to the other one so they can reach homing missiles. Think of the rocket power-up player as a massive bomb reserve to prevent the shot power-up player from dying and downgrading their shot power. Then the shot power-up player should get all the extra bombs to better prevent any single death of theirs, while the rocket power-up player should get the two extra ship icons in the game. One thing the rocket user should be aware of is how effective homing missiles can be from a safe distance by simply holding backwards on the left edge of the screen, causing them to arc and home in on their targets more quickly. Still can be fun though when both players understand how to tackle it and are OK with not getting a fully satisfying power-up experience in a playthough. I'm personally always looking for other people to netplay their way through it with me. Actually I think the limited powerups forcing each player into distinct roles gives the game a very interesting flavor. I can see the argument that is wasn't explicity designed for coop, but even if it was accidental, it's actually a really interesting coop game. Shmup 2ccs in general require a very different planned approach no matter what the game is and I think that's part of the charm. Working out how to get through it despite the single play oriented design is part of what makes it interesting. I wouldn't call it casual friendly though, it's more of a stimulating coop experience for dedicated players. I've been focused clearing Darius Gaiden until now (using autofire, but I set the delay to 4/5 so it's like a 1,5x speed version of default autofire), I once use ABDHLQV route, no miss'd until mid stage and lost all my lives when facing final boss. Is there any other easiest route than ABDHLQV ? I practice ABEINTZ, which isn't too bad, though the final boss (Odious Trident) is a foe I've yet to fell (without auto). Generally any route where you avoid Neon Light Illusion, Titanic Lance (Zone M), and Crusty Hammer will be an "easier" route.